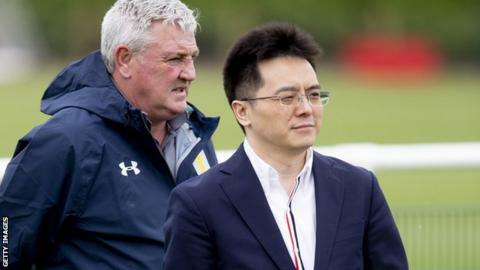 Aston Villa are not up for sale but would consider minority investment, owner Tony Xia has told supporters of the Championship club. In an open letter to fans, Xia also said manager Steve Bruce would remain in charge at Villa Park. However, the Chinese businessman said the club must sell players to reduce costs after they missed out on promotion to the Premier League. "Losing out on promotion was a disappointment to us all," Xia said. "Not least you, the fans, whose support took us to the brink of promotion. "For the avoidance of doubt, I remain a proud and committed owner of this football club and with that accept and embrace the responsibilities to the fans, players and staff." Villa have endured a tumultuous few weeks since losing to Fulham in the Championship play-off final in May, costing them a potential £160m in future revenue. They missed a £4m tax payment in June, with Xia understood to have cash flow problems because of strict rules about money leaving his native country. The club reached an agreement with HM Revenue & Customs over its payment soon after, but Xia has been forced to restructure his senior management team. Chief executive Keith Wyness was suspended and then subsequently left Villa Park, and director of football Steve Round departed on Wednesday. But Xia said Bruce, who has been at the helm since October 2016, had his support. "I have had numerous conversations with Steve Bruce in recent weeks," Xia added. "It reinforced how fortunate we are to have someone of his experience and standing in the game. "His leadership will be important for us on the field, as a club and as a community and I thank him for his loyalty." A squeeze on Villa's finances has already seen captain John Terry and loan players Robert Snodgrass, Lewis Grabban and Sam Johnstone leave, while midfielder Jack Grealish has been linked with a move to Tottenham. And Xia indicated the club may have to rely on some of its youngsters next season and they would have to sell players to comply with Financial Fair Play (FFP). He said inward investment would not contribute towards meeting those requirements. "A more measured approach will enable us to overcome the implications of FFP after two years of significant investment in the football department," Xia said. "We need to generate sufficient revenue to ensure the smooth-running of the club without compromising the standards of this great institution. "With that comes a reality check over performance and expectation for the season ahead but also the opportunity to work smartly in the transfer market, bring through young talent and draw on the experience of our manager."